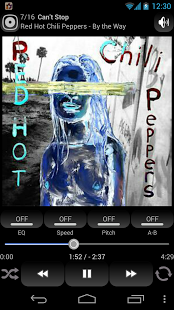 Powerful MP3 Player with Audiobooks support for Android. Bookmarks, variable speed playback, A-B repeat, equalizer, scrobbling, and more. – Doesn’t support MP3 files downloaded by TubeMate. See Q&A. You can activate the following extra features by purchasing Unlocker. 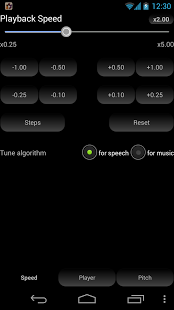 to auto-stop audio playback when your phone starts ringing. Q. Cannot open MP3 files downloaded by TubeMate. Why? A. The app doesn’t support MP3 files downloaded by TubeMate (or other downloaders). They are not real MP3 files in many cases. A. 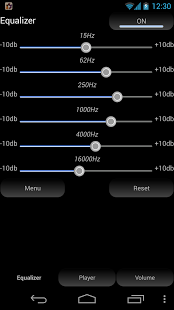 Please increase the ‘Audio Buffer Size’ in the settings. The bigger the audio buffer size, the lower the chance you will hear unexpected clicks in the audio when using a lot of processing power. But at the same a bigger audio buffer size also causes a higher latency. Using a smaller audio buffer size gives you a lower latency, but then make sure your CPU can handle it, otherwise clicks may appear in your audio because the CPU can’t process it all quick enough.